The 1933 Long Beach earthquake took place on March 10 at 5:54 P.M. PST south of downtown Los Angeles. The epicenter was offshore, southeast of Long Beach, California, on the Newport–Inglewood Fault. The earthquake had a magnitude estimated at 6.4 Mw, and a maximum Mercalli intensity of VIII (Severe). Damage to buildings was widespread throughout Southern California. 115 to 120 fatalities and an estimated forty million dollars' worth of property damage resulted. The majority of the fatalities resulted from people running out of buildings exposing themselves to the falling debris. The major damage occurred in the densely-populated city of Long Beach on the south-facing coast of Los Angeles County. However, the damage was also found to have extended to the industrial area south of downtown Los Angeles. The magnitude of the earthquake is considered to be medium but a significant amount of damage was left due to unfavorable geological conditions (landfill, water-soaked alluvium) combined with poorly constructed buildings. In Long Beach, buildings collapsed, water tanks fell through roofs, and houses were tossed off their foundations. School buildings were among the structures that incurred the most severe damage. It was recognized that unreinforced masonry bearing walls is the reason for school buildings suffering so much damage in the wake of the earthquake. The earthquake highlighted the need for earthquake-resistant design for structures in California. Many school buildings were damaged, with more than 230 school buildings that either were destroyed, suffered major damage, or were judged unsafe to occupy. 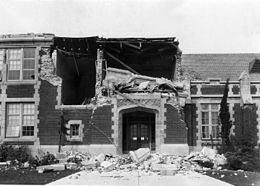 The California State Legislature passed the Field Act on April 10, 1933, mandating that school buildings must be earthquake-resistant. If the earthquake had occurred during school hours, the death toll would have been much higher. This earthquake prompted the government to play an active role in disaster relief. The government created The Reconstruction Finance Corporation, providing loans for the reconstruction of buildings that were affected during the natural disaster. The Bureau of Public Roads also took action to rebuild roads, highways, and bridges. The economy of Long Beach was able to return to normal swiftly because of the rise of the aircraft industry. To support the World War II efforts, Long Beach created naval yards and increased the number of aircraft produced. This directly helped Long Beach repair and stabilize the economy after the disaster. The earthquake plays a major part in the novel The Last Tycoon (1941), by F. Scott Fitzgerald. During the disruption caused by the quake, the hero, Monroe Stahr, meets Kathleen Moore, with whom he falls in love. ^ USGS. "M6.4 - 7km WNW of Newport Beach, CA". United States Geological Survey. 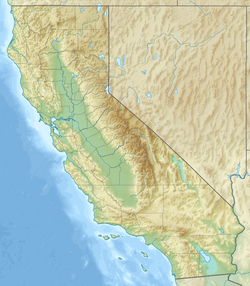 ^ This article incorporates public domain material from the United States Geological Survey document: "Earthquake History of California". Archived from the original on 2000-08-17. Retrieved 2018-05-02. ^ Green, Melvyn; Watson, Anne L. (1988). "Building Codes: Evaluating Buildings in Seismic Zones". APT Bulletin. 20 (2): 13–17. doi:10.2307/1494245. JSTOR 1494245. ^ Alquist, A. E. (February 2007). "The Field Act and Public School Construction: A 2007 Perspective" (PDF). California Seismic Safety Commission. Retrieved 27 January 2011. 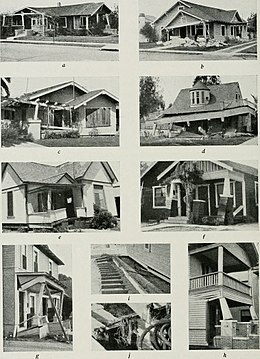 Wikimedia Commons has media related to 1933 Long Beach earthquake. This page was last edited on 23 April 2019, at 16:35 (UTC).